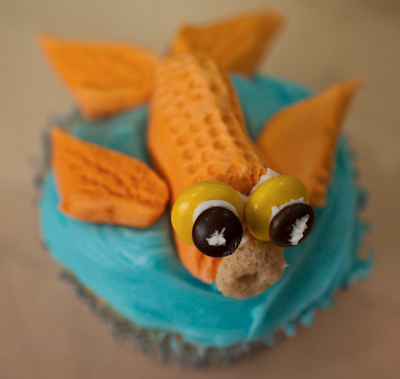 Decorating Fun Cupcakes ~ Learn, Live, and Explore! This month, I took two classes to continue my pursuit to become a master cupcake maker. Ok, so that's not really my life's quest, but I do enjoy cupcakes and using my creative energy to make adorable decorations. Since I had some success with classes at Sur la Table in the past, I opted to take their cupcake decorating class that is based on the book, "What's New, Cupcake?" 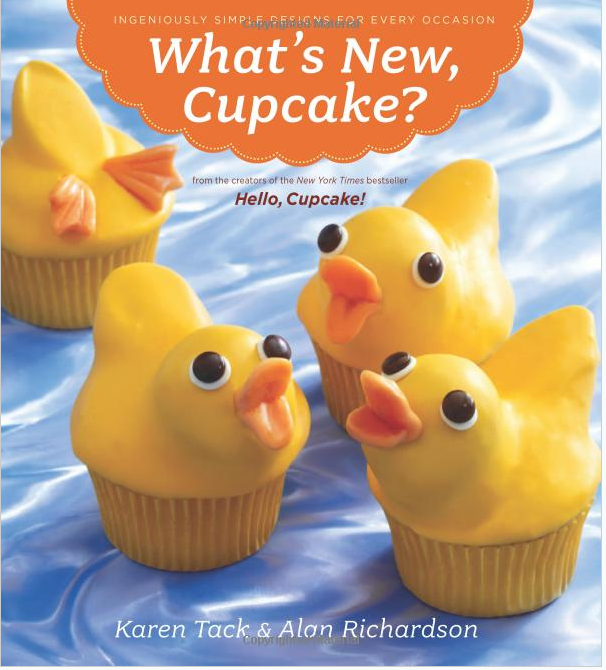 - one of three instructional books by Karen Tack and Alan Richardson. 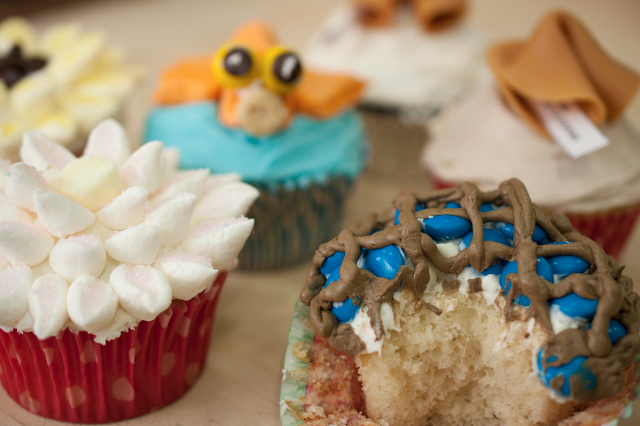 The four designs highlighted in the class were the fortune cookie, koi fish, marshmallow mum, and berry pies. 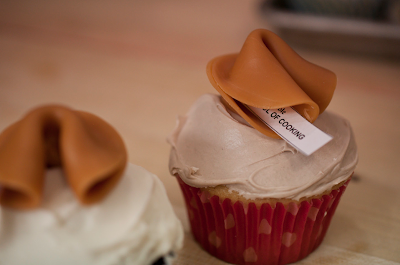 The fortune cookie is a simple frosted cupcake with a caramel fortune cookie topper. Microwave two cubes of caramel candies for 3-4 seconds just to soften. Work together and roll out on a cutting board wrapped in plastic wrap. 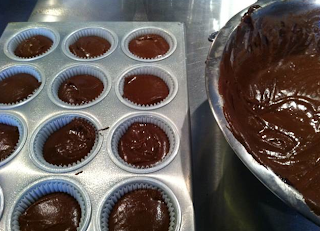 Using a 3" round cookie cutter, cut a circle in the rolled caramel. Place your paper fortune message slightly off-center, to the right and down. Fold on the half and push the ends together in the middle only. Then stick your fingers in near the fold and gently bend the caramel in half, bringing the two ends on the fold together. The koi fish is perfect for kids because I think only kids would like eating those marshmallow orange peanuts! Frost the cupcake in blue. For the body, take one candy marshmallow peanut and snip the end on an angle, cutting up and in from the flat side. Using frosting as glue, attach eyes (two M&Ms or Reese's Pieces and two mini M&Ms) and mouth (Cheerios cereal) to the angled edge. 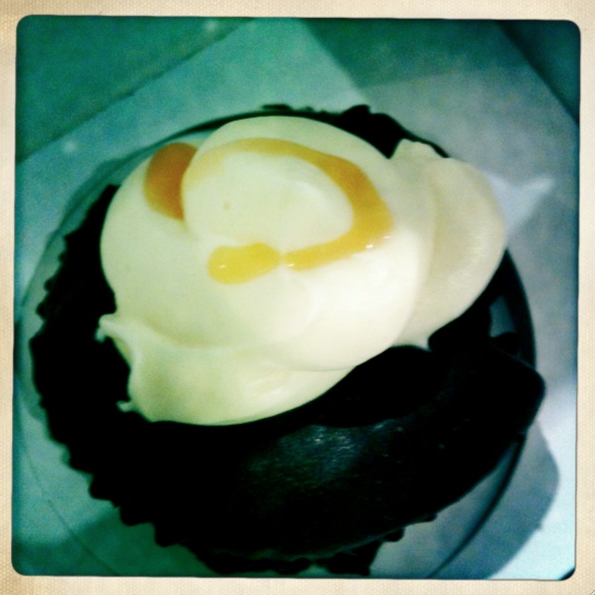 Set on top of cupcake. Take another peanut candy and cut in half lengthwise. Cut each half at an angle. Play around with the shapes and make the tail with two pieces and the fins with the remaining two pieces. Another simple design is the mum. Generously frost the cupcake in order to have enough frosting for the marshmallows to stick. Take miniature marshmallows and squeeze them on the long edge, elongating the shape into a square, then cut on the diagonal. Dip the sticky side (the cut side) into a colored dusting sugar for color. Attach the outside layer first, and work your way in. 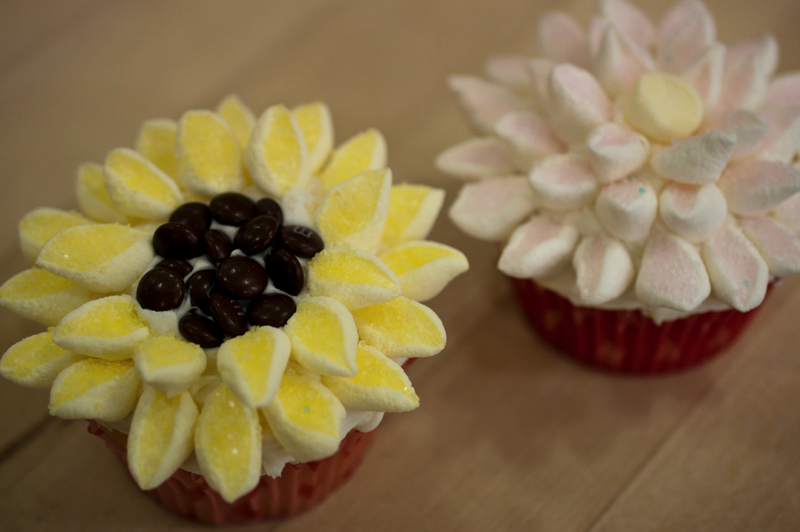 I liked using half of a miniature marshmallow for the center, or for a sunflower look I used the brown mini M&Ms. Out of the four, the pies were the most complicated, but still very easy. 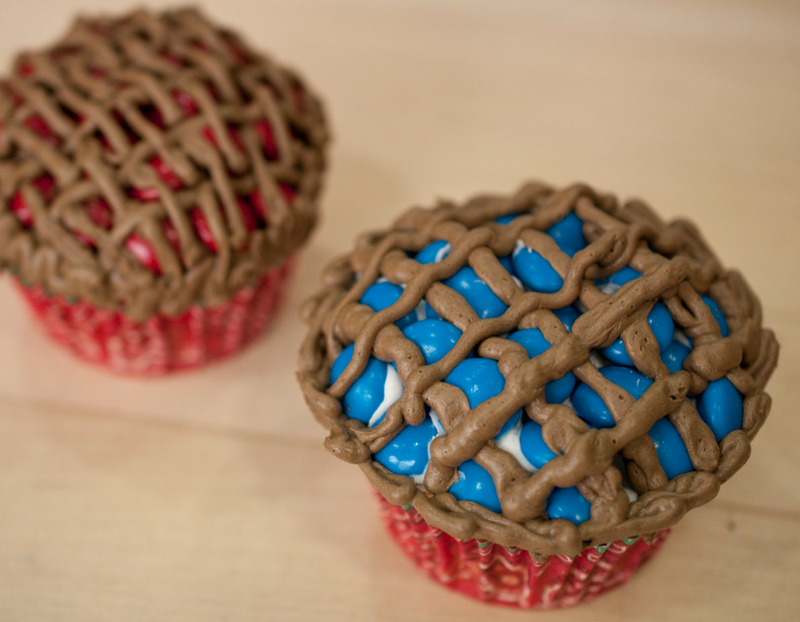 Frost a cupcake with a brown colored frosting. Select a color of M&Ms or Reese's Pieces that matches the color of the "fruit" you'd like to portray. Cover the frosted cupcake with these candies. Fill a piping bag with some of the brown frosting, using a circle tip that is a small-medium opening. Pipe diagonal stripes on the M&Ms to create the lattice-work on top of the "pie," then use a shell piping technique (anchor the piping tip, push forward then drag back, layering the loops on top of each other) on the side to make the crust and clean up the edges. I tried to use the basket weave technique on my cherry pie, but the frosting tip wasn't the right size, so it came out a bit messy. While this class was fun, it definitely was nothing you couldn't do on your own using the photos as samples or by just buying the book on Amazon. Continuing with the pursuit of cupcake knowledge, I also took advantage of a recent LivingSocial coupon offer in D.C. We are very fortunate to live in the headquarters city for LivingSocial because they are testing out a physical classroom location for special offers, like cooking classes, pop-up restaurants for local chefs with new restaurant concepts, concerts, and art classes. 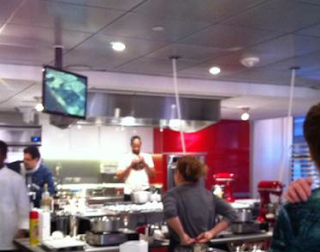 The cooking classes offered so far have been with notable chefs and restaurant owners in D.C. 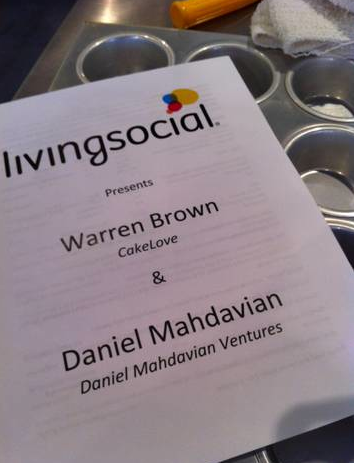 This class I took was lead by the founder of one of the, if not THE, first cupcake shops in D.C. - Warren Brown from CakeLove. 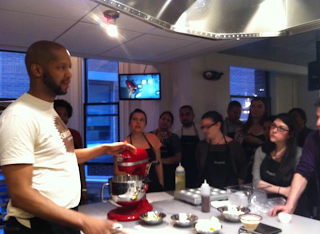 Chef Warren Brown was very friendly and even gave me the secret to his yummy strawberry frosting, which is fortunately just the recipe for the meringue buttercream with fresh sliced and sugared strawberries blended in. In addition to the cupcake instruction, we also received instruction on how to make a chocolate spice martini and a citrus ginger champagne cocktail from Warren's friend, mixologist Daniel Mahdavian, that accompanied the rich cupcake. I ended up not taking home any finished cupcakes that I made because I'm not a huge chocolate cake fan, but what I tasted in the class was a nice, light density cake. This was surprising because normally CakeLove cakes are dense, probably due to the pounds of butter that go into them! We also received a sample of a cupcake prepared by CakeLove for the class to take home with us so we could see the finished product. I think, overall, this was a great experience and a perfect introduction to a whole new venue for me to learn new skills from the experts, and I will definitely be keeping my eye out for upcoming classes at the LivingSocial facility! Very tasty cupcakes. You can visit cake decorating shop to find best collection of cupcakes.